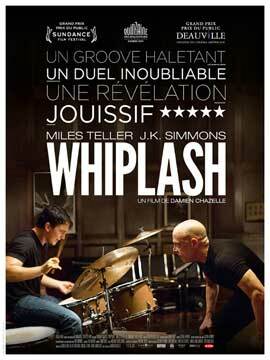 I saw “Whiplash” today and my neck is just fine. However, I can’t stop tapping my toe. Andrew (Miles Teller from “The Spectacular Now“) is a drummer. He is a drummer more than he is a son, a student, a boyfriend or even a human being. His entire existence is defined by his ability to bang a drum and his aspiration for greatness. Andrew gets into the best conservatory in New York and works to catch the ear of the great Terrence Fletcher (J.K. Simmons from “Labor Day“), who conducts the school studio band. Fletcher’s reputation for perfection is only surpassed by his reputation for being a colossal prick. His method is to pound greatness out of these kids or snap them like twigs in the process. Fletcher is tough on Andrew, but he is tough on everybody. That is his way, and everybody knows it. The entire band looks at the floor when he walks in. They all want his approval or at least to not be the one he picks on. That’s what it seems like, that he is picking on them. What Fletcher is doing is to pushing them beyond what they think their limits are. He doesn’t coach or coax the best out of Andrew; he berates and humiliates him every way possible to prove worthy of his admiration. Both Teller and Simmons give masterful performances, and while there are some other folks in this movie, it’s a two-man show. On the face of it, one sees student and mentor, but it’s deeper than that. It’s about the obsessive nature of both men, what drives them to be the best. Not the best they can be, better than that – better than everyone who has ever lived. The bar is so high neither knows how it can be measured. Director/Writer Damien Chazelle (“Guy and Madeline on a Park Bench”) conducts the story like a symphony with sparse dialogue while his Spartan soldiers go head to head with their inner demons. 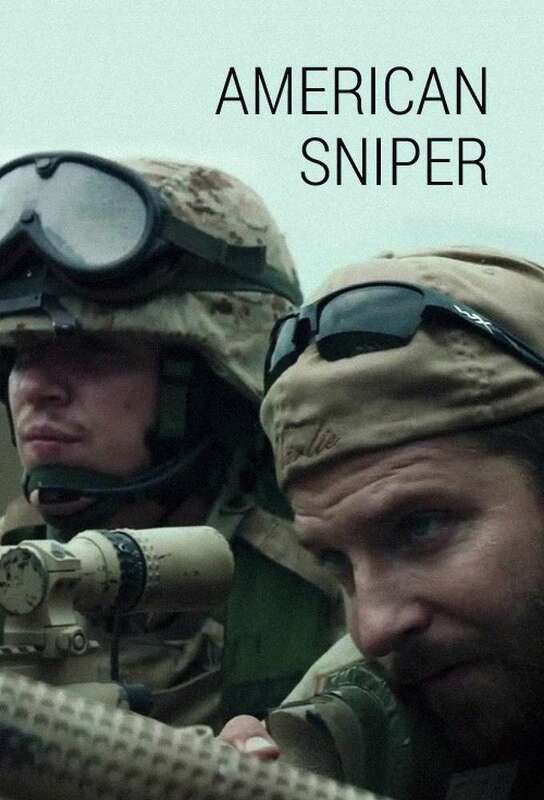 This was a nerve-wracking movie to watch and I felt more comfortable last week seeing “American Sniper.” They did not try to make a nice little movie, just as Fletcher did not try to mold a nice little drummer boy. I had tough teachers in high school, college, and tough coaches. People who pushed and motivated me. Fletcher’s kind used to be commonplace, and I doubt they have all gone away. The road to mediocrity is paved with people patting you on the back saying “good job.” The road to excellence may kill you, but it’s only for those who will die if they don’t take it. This is not your fuzzy, feel good, “Paddington Bear” kind of movie. This is a character study of the gut-wrenching quest for the quintessential performance to prove you are the best. And for that reason, I must give this movie 4 ½ stars out of 5. Those who ask why Andrew and Fletcher do what they do may never understand greatness. I saw “American Sniper” today, but I don’t think he saw me. It’s only right for this movie to be directed by The Outlaw Josey Wales (Clint Eastwood from “Gran Torino“), another guy who just wanted to be a cowboy. Chris Kyle (Bradley Cooper from “American Hustle“) liked horses and girls and belt buckles so big that a girl would like him. They grow ’em like that in Texas. When terrorists hit our embassies, he enlisted in the Marines. He became a Navy Seal and, yeah, a sniper. Just before he ships out, he marries the love of his life, Taya (Sienna Miller from “Foxcatcher“). She is an amazing reason for him to come home, but he almost never comes home. This didn’t feel like a movie with a plot and a protagonist trying to win the day. We had an observation post that let us witness a little piece of the life of a sniper, this American Sniper. There were no winners here. The movie could be called Tour of Duty because he has four tours and his duty to his country and his men come first. A life with his family will have to wait, because the men who count on him cannot. “There’s a war going on and I am going to the mall,” he tells Taya when she doesn’t understand his inability to engage her at home. We see how Chris Kyle was the Tom Brady of snipers. The guy every soldier wanted on his team watching his back. What Eastwood and Cooper also show us is how Kyle carried this burden on his broad shoulders as his tough guy façade took so many shots it started to crack. Everything about this movie rings true, and I saw nothing that was pumped up by a pounding score to create tension or shaky cameras to convey shaky situations. Where a Spielberg may try to create an epic, Eastwood focuses his lens on the man, the legend, Chris Kyle. In him, we see the essence of man and his allegiance to God, Corps, Country and family, and watch him figure out what order these things should be in. It’s an incredible story, and Eastwood does not try to explain it or tell us what to think about it. I would say unflinching, but I flinched about 50 times. This movie will get to you, and stay with you. It’s not a feel good movie, or a “rah–rah to victory” movie. It’s a movie that will bother you. Nothing that Chris Kyle ever did bothered me. He did it because that was his job and his calling and the way he was made. What happened after that bothers me, the way it bothered Josey Wales. For that reason I must give this movie 4 ½ stars out of 5. When they make my life story, I want Bradley Cooper to play me, but they will probably cast Larry David. Inherent Vice is “the tendency in physical objects to deteriorate because of the fundamental instability of the components”; so now you don’t have to look it up like I did. This may be theme of the movie as it exploits all the other vices. Doc (Joaquin Phoenix from “Her“) is a little hard to explain, but it’s 1971, so you might as well know that going in. People come to him for help, for drugs and because he’s a private investigator. When his old flame Shasta (Katherine Waterston from “You Must Be Joking“) shows up and asks for his help, he mumbles something and she leaves him with his tongue hanging out. Doc begins sticking his nose in places it doesn’t belong, like a cross between The Dude and Jim Rockford. It was almost a buddy picture with the sordid relationship between Doc and Lt. “Bigfoot” Bjornsen (Josh Brolin from “Oldboy”). The whole thing felt very derivative to me, but maybe that’s because I lived through the ‘70s. I am a fan of Director/Writer Paul Thomas Anderson (“The Master”) and his eclectic style and depressing brand of historical drama. Here, he is tied to the novel by Thomas Pynchon, which I am guessing is just as confusing as the movie. I was thinking this was his shot at film noir, but there were no women doing anything significant here. They are all objects to be objectified while they have no objective of their own. Sure it was the ‘70s, but that is no excuse. Phoenix does an amazing job with a complex character and makes it look easy. We totally buy him as a worthless hippie, though he is the only character on the screen that has any principles or guts enough to do the right thing. He is surrounded by talented actors whose characters are much stranger than he comes off. Sure, the movie meanders and the plot is never clear and every 10 minutes a new character is introduced who is way too weird or convenient. All the while, our hippie hero keeps lumbering forward against forces that will never let him win. It’s a good thing winning is not his objective. This movie is not everyone’s toke of Tupelo Gold, but I found it to be entertaining and enjoyable since I didn’t know what was going to happen or why. I just let the movie “flow over me,” as William Hurt said in “The Big Chill,” and it was cool. For that I must give it 4 stars out of 5. This movie might be just what you are looking for if you don’t know what that is. I went “Into The Woods” today where Henry David Thoreau wished to live deliberately, and wishes are what this movie is all about. I just wish I would have known this going in. The Baker (James Corden from “Begin Again“) and his wife (Emily Blunt from “Edge of Tomorrow“) wish they could have a child. Cinderella (Anna Kendrick from “Drinking Buddies“) wishes she could go to the ball. Jack (Daniel Huttlestone from “Les Miserables”) wishes he could sell the family cow for five pounds. Little Red Riding Hood (Lilla Crawford in her feature debut) wishes she could have more sweet breads to carry to grandma’s house. Rapunzel (Mackenzie Mauzy from “Brother’s Keeper”) wishes she could leave the tower and find true love. The Witch (Meryl Streep from “The Giver“) wishes to break the curse that stole her beauty. I wish I had an iPhone app for all these Grimm Fairy Tales. This is not one of those French things where they show you four or five stories going on at the same time with a common theme. 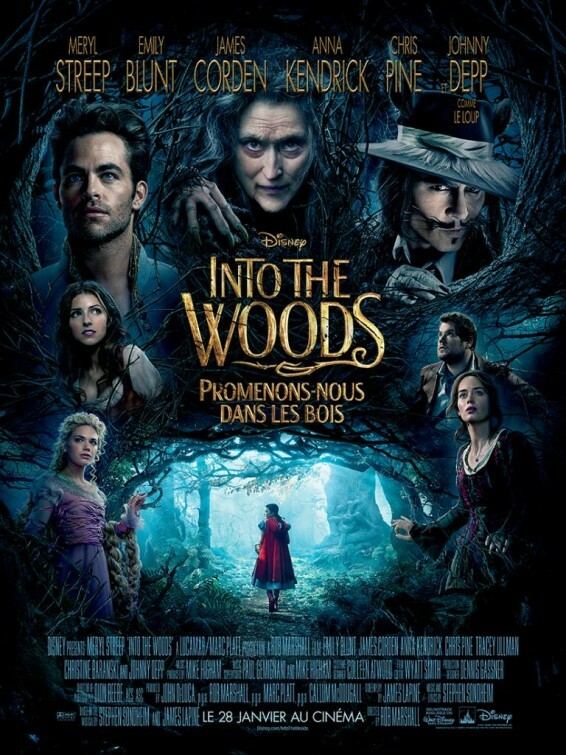 This is a true mash-up where good old “beanstalk Jack” runs around with Red Riding Hood and Cinderella. And I almost forgot to mention that most of the dialogue is delivered in song. This Stephen Sondheim Broadway Musical took 25 years to make it to the big screen. In the hands of Director Rob Marshall (“Chicago”), magical things happen, but it still feels like you are watching a stage play. While the songs are lovely, they call more attention to themselves than the story or the characters. A case in point is when the entire theater giggled as the princes pranced around a waterfall. I do like the whole classic fable thing, and I can handle the cinematic cacophony of characters. I was okay with a few twists, but the ending fell flat, like a giant from the sky. These characters from our childhood are precious, so I don’t like seeing them get abused. There were some great performances and plenty of things to smile about. Marshall does the best he can to transform the live performance to the silver screen, and I feel I must applaud the effort. For that I must give it 3 1/2 stars out of 5. I wish I had seen it on the stage. I thought about “Selma” when I passed the sign on I-95 last week in North Carolina. Turns out I don’t know much about the Civil Rights Movement, since the movie is about Selma, Alabama. This movie begins in 1964 when Martin Luther King, Jr. (David Oyelowo from “Interstellar”) was awarded the Nobel Peace Prize. So he was already a pretty big deal when he decided to go to Selma. As a national leader in the quest for social justice, he knew he must respond to the tragedies and the mistreatment of his people. His wife, Coretta (Carmen Ejogo from “Alex Cross”), fears for his life, but she knows he must go. President Johnson (Tom Wilkinson from “The Grand Budapest Hotel”) is basking in the glow of passing Civil Rights legislation and wants King to just be happy with that for now and not make any waves. Johnson is aware of how the southern states systematically keep blacks out of the voting process but is unwilling to spend any more political capital. As long as this issue stays off Facebook, I mean, the nightly news (ask your grandfather what this is), he is not going to do much. This is just a small snapshot of King’s legacy with an inside peek at some of his personal struggles. He is not portrayed as a perfect man, just a man with a vision of how things should be; a man who stood in defiance of an imperfect system. We see the weight of leadership on the shoulders of this humble man. He led with the rare combination of quiet dignity and a thundering voice, speaking words that would change minds and make history. 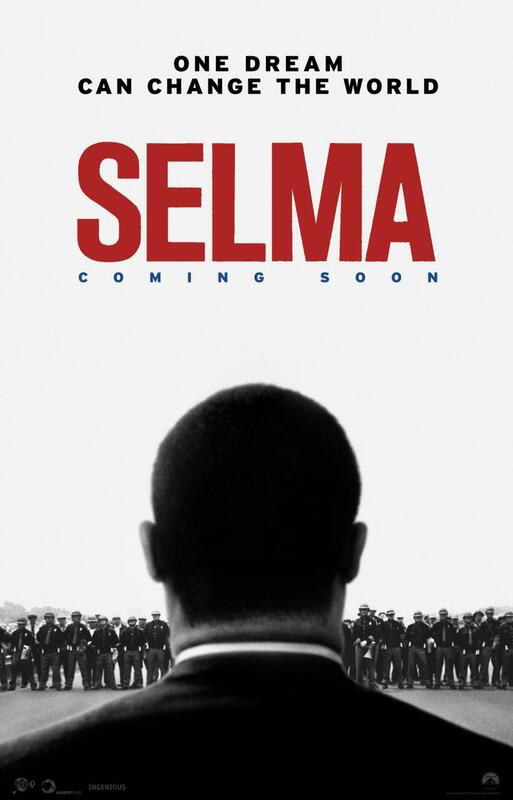 I am not ashamed to admit I did not know where Selma was or to admit how well this movie tells a terrific and tragic story. For that reason, I must give this movie 4 ½ stars out of 5. Take a page from this movie and make waves with words as your weapon.